John C. O'Connor - O'Connor & Thomas, P.C. John C. O’Connor was born in Dubuque, Iowa. He is the third generation of the O’Connor family to practice with this firm, joining the firm in 1976. John attended Loyola University of the South and received a Bachelor of Business Administration degree in Accounting in 1971. He obtained his law degree from Creighton University in 1974 and was admitted to the Iowa Bar in 1974. John is a Commissioned Reserve Officer in the U.S. Army reaching the rank of Captain. He has been a Certified Public Accountant since 1975. 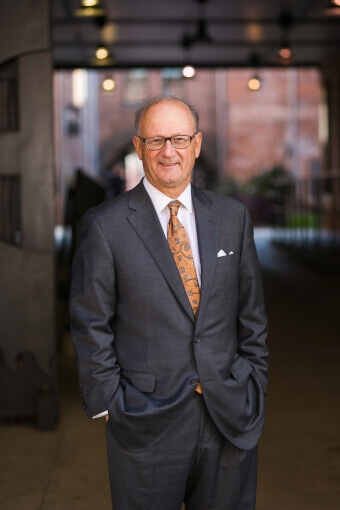 He is a member of the Iowa State and Dubuque County Bar Associations, the Iowa Society of Certified Public Accountants, and is a Fellow of the American College of Trust and Estate Counsel. John is one of the founding Directors of the Community Foundation of Greater Dubuque and served as Chair for five years. He served on the Board of Directors for the Boys & Girls Club of Greater Dubuque since 1982, and is a past President. John has and is serving many other non-profits in a variety of ways. He also serves on the Board of Directors of several businesses in the Dubuqueland area. John received the TH First Citizen Award for 2014 for the dedication he gives to his community. John’s general practice includes, but is not limited to the areas of corporate and business law, wills, probate, estate planning, taxation, trusts, contracts, and real estate. Named 2016 Super Lawyer in Business and Corporate Law. Received TH First Citizen Award for 2014.